The TRACE MODE® 6 SOFTLOGIC component is a powerful tool for industrial controller programming, being completely integrated with SCADA/HMI. The TRACE MODE SOFTLOGIC makes it possible to develop the DCS-style applications – i.e. in such a way, like the development of large-scale and the most crucial process control systems for power engineering, chemistry, atomic and petroleum industry is performed. Programming of controllers, HMI and business-applications is performed in the integrated development environment of TRACE MODE and in the same IEC 6-1131/3 programming languages. This makes it possible to use powerful facilities of remote online and offline debugging of entire project as a whole. However, the TRACE MODE SOFTLOGIC controller programming tool does not have such a high price like the DCS development systems have. Due to the TRACE MODE SOFTLOGIC, the high technologies of controller programming, are now quite affordable to everybody. Programming of controllers is performed in the development system, from where the SOFTLOGIC-program is uploaded to memory of the controller, and its execution is provided by the Micro TRACE MODE runtimes. The Micro TRACE MODE runtimes can be installed in open controllers under MS DOS, Windows CE.net or other operating systems. The drivers for I/O devices are normally supplied free of charge along with TRACE MODE development system. While selecting TRACE MODE 6 SOFTLOGIC for programming of a particular controller, check the controller support list, or contact the manufacturer. In case if the required I/O driver is not available il the list, the user can develop it independently according to open driver specification. For that purpose, the appropriate driver templates are included in the TRACE MODE documentation. Drivers for devices interfacable through the serial port, can be written as easy as I/O drivers. However, prior to starting writing your driver, contact the AdAstrA Research Group, Ltd sales, maybe the required driver is already available, or can be written by AdastrA free of charge. AdAstrA Research Group, Ltd adheres to the policy of active co-operation with the programmable controller manufacturers, therefore the list of devices compatible with TRACE MODE grows constantly. It is very easy to program controllers in TRACE MODE 6. Development of a SOFTLOGIC project begins with the autobuilding of the controller I/O. Then, according to the I/O structure the Micro TRACE MODE channels autobuilding is performed. Thus, the major part of routine work for controller programming is automated! Add to the obtained project the logic programs, written in one of 5 IEC 6-1131/3 languages of controller programming at your choice, and the project is ready. Download the project remotely to the controller, via a built-in service (available not to all PLCs), run it without quitting the integrated development environment and proceed to debugging. diagnostics facilities for TRACE MODE® 6 based control system in the operating mode. A SOFTLOGIC project can be downloaded into a controller remotely, and can be remotely run there. Clicking on the online debugging button, one can obtain actual real time data from the controller directly in the editor of TRACE MODE SOFTLOGIC alongside each input and output of the program’s functional blocks. After quitting the online mode, one can continue debugging the program in emulation mode (manual debugging), while using the real data obtained from the remote controller. The TRACE MODE SOFTLOGIC controller programming system provides the automatic updating of a program in the remote controller after its editing. For that purpose, it would not be necessary to reboot entire controller – it is possible to update only the edited component. 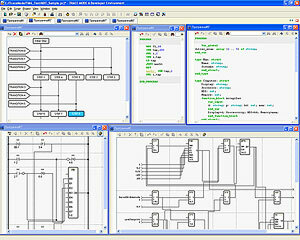 A developer using TRACE MODE SOFTLOGIC for controller programming, obtains a unique possibility to debug a project of a distributed control system on a single PC with the special SPY debugger. The SPY can connect remotely, to any operating TRACE MODE® 6 controller or server, via TCP/IP network, and get the online information about all project variable state the in real time. The TRACE MODE integrated development environment offers distributed control system development, therefore, the HMI screens can be linked to the Micro TRACE MODE node channels directly. Flexibility provided by the architecture of uniform project allows doing the exiting things: for example, a controller can independently initiate an SQL-query, and receive data from an external database without additional channels. At the same time, technology of autobuilding would eliminate mistakes of manual set up and cut the routine work during the controller programming. In case if the information from the Micro TRACE MODE channels must be transmitted to the HMI node based on the Real Time Monitor (RTM) for logging, copies of the Micro TRACE MODE channels can be created in the RTM node automatically by the same autobuilding technology. Thus, the amount of routine work in the controller programming in the TRACE MODE SOFTLOGIC is reduced to minimum. The TRACE MODE controller programming tools can also be used for stand alone PLC applications having no HMI. For high-reliability, fault-tolerant control systems one can use the controller automatic hot redundancy feature built-in the TRACE MODE 6 SOFTLOGIC. The dual and triple redundant control systems can be made in TRACE MODE quite easy – “in-one-click”. It is not only easy to perform logical controller programming in the TRACE MODE 6 SOFTLOGIC system, but it is also quite affordable. The economy is obtained through the project development and debugging time cut, and also due to the reduction of costs associated with the control system support. In addition, the user of the controller programming system is free in hardware platform selection, since the programs written in the IEC 6-1131/3 languages are portable to other type of SOFTLOGIC controllers, and no additional training for developers would be required.